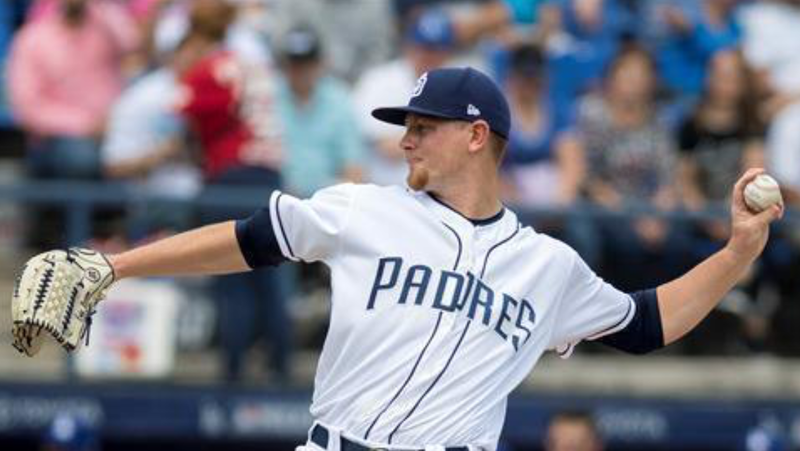 The San Diego Padres dropped the series opener against the Cincinnati Reds yesterday, snapping a modest three-game winning streak thanks to a largely disappearing offense. Going up against Matt “The Dark Knight” Harvey, the Padres played the part of The Joker, collecting twelve hits and eight runs in the victory while only needing one extra base hit to take an 8-2 victory. Of course, they would get plenty of help from the Reds’ defense as the first batter to open the bottom of the first, Travis Jankowski, got on thanks to a throwing error by catcher Curt Casali. The scrappy outfielder swiped second and advanced to third when Matt Harvey uncorked a wild pitch. He strolled past home plate on a sacrifice fly hit by Jose Pirela, scoring the first run of the game. The lead wouldn’t last long. Rookie starter Eric Lauer, looking to work out the kinks in his pitching approach, left a juicy fastball right over the middle of the plate and Casali, in his first at-bat as a Red, pulled the baseball into the lower seat of the Western Metal Building for a solo home run. Lauer would rebound by striking out Harvey and getting a fortunate batter’s interference call on a bunt attempt by Billy Hamilton. San Diego didn’t take to kindly to Cincinnati tying the game up and went to work putting small chinks in Harvey’s armor. First it was Franmil Reyes hitting a sharp single to center field, followed by another single by shortstop Freddy Galvis. Veteran catcher A.J. Ellis baited a walk from Harvey and Manuel Margot, who is still fighting through a sophomore slump, sliced a double to right field that would bring home both Reyes and Galvis. Lauer would get in on the scoring fun by lifting a fly ball to right field. Ellis showed off his wheels by tagging up and scoring, giving Lauer his first Major League RBI. The Padres weren’t done scoring as Jankowski, the sixth batter of the inning, pulled a single into right field to score his outfield compatriot Margot, and the Padres would leave the inning with a 5-1 lead. Lauer would go back out and dance through the raindrops in every inning he would throw. However, Lauer danced through those raindrops with the swagger of James Brown and the coolness of a fall night in San Diego, picking off Joey Votto at first base to end the third inning after allowing the latter to single to right field. He allowed a two-out single to Scott Schebler and walked Casali, but battled back to strike Harvey out to escape the fourth. His fifth and final inning saw Jose Pereza knock a ground-rule double to left-center field, but neither Scooter Gennett or Votto could drive him home as Lauer got weak contact from the both of them to end the inning. Lauer would be done after the inning and put together a swell, if not stressful, start for manager Andy Green. The rookie bounced back from his previous game by tossing five innings of one-run ball, giving up five hits and two walks while striking out four Cincinnati batters. 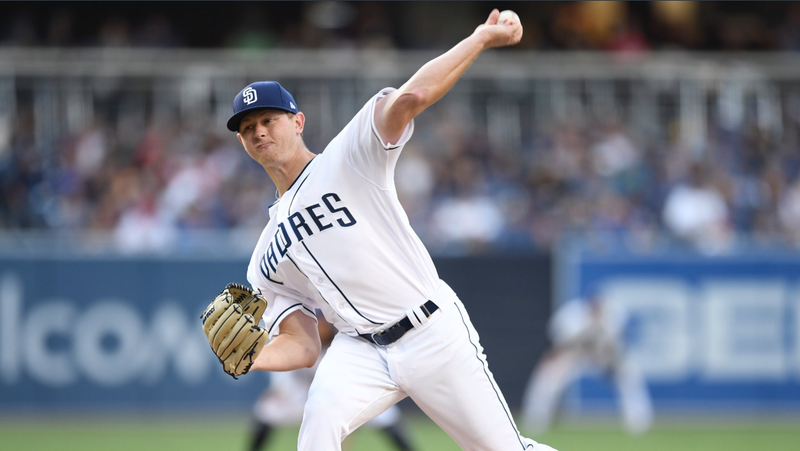 Starts like this show that Lauer can stick in the San Diego rotation, but he will have to be more consistent with his command to be successful. Adam Cimber and Craig Stammen breezed through the sixth and seventh inning respectively and the Padres’ hitters would tack on more runs in the bottom of the seventh. Jankowski did what he does best, leading off with a single and, with reliever Dylan Floro worrying about Eric Hosmer, picking up his tenth stolen base and second of the game. Hosmer struck a ground ball that glanced off the glove of a diving Gennett and trickled into right field, scoring a dirty Jankowski. With this hit, @TheRealHos305 sent @FreddyJ_6 home. Back-to-back singles by Christian Villanueva and Jose Pirella led to a two-RBI single by Matt Sczur for the final San Diego runs of the game. Jose Castillo, in his Major League debut, tamed the heart of the Reds’ lineup by striking out Votto, Eugenio Suarez, and Adam Duvall to sail past the eighth while Phil Hughes closed out the ninth inning, giving up a lead-off home run to Schebler, but then proceeding to get the final three outs in order to preserve a Padres win. San Diego will be looking to take the series against Cincinnati tomorrow on Military Sunday with Tyson Ross on the mound, while the visiting Reds will counter with Luis Castillo. Lauer’s pickoff of Votto in the third inning was his fifth of the year. This ties him for the Major League lead. Castillo is the first Padre to strike out the side in his Major League debut since Tommy Layne accomplished the feat in 2012 against the Atlanta Braves. Jankowski stole his team-leading tenth bag today. The leadoff hitter has settled nicely into his role as he is now hitting .314 with an OPS of .773 while consistently providing a spark when the situation calls for it.